Just a week after Marvel vs. Capcom: Infinite’s official launch, the fighting game community is starting to showcase a deep understanding of what makes the game tick. They’ve figured out mechanics that are unexplained in Infinite’s tutorial and concocted high-level competitive strategies that have contributed to amazing tournament wins. The discoveries started before Infinite even had a chance to find its way to store shelves. In the demo version, which Capcom made available three months before the official September launch, players stumbled upon a handful of under-explained techniques. These newly discovered systems may be very granular, but they demonstrate the very start of players figuring out how a fighting game that’s likely to be a major part of future tournaments actually works. These early discoveries stand to have a big influence on how pros play the game. For example, players are fighting out that there’s an alternate way to jump that provides competitors with a brisk, low-to-the-ground aerial maneuver capable of catching their opponent off guard.. In the Marvel vs. Capcom franchise, players typically have access to two different kinds of jumps: a regular jump performed by simply pressing up and a super jump, which provides added height when a quick down input is used beforehand. Infinite, however, adds one more option in the form of its hyper hop. This is less an established mechanic, like King of Fighters’ built-in variable jumps, and more a manipulation of super jump momentum, but its applications are similar. Another secret mechanic focuses on a player’s options after activating Infinity Storm, a super-powered mode that varies depending on which Infinity Stone their team has equipped. The Power Stone, for instance, gives characters a short window where damage is increased and attacks bounce opponents off the wall, while the Space Stone places opposing players in a literal box that limits their movement. As players figure out hidden moves here, they’re in the process of learning strategies that could help them turn the tide in a close match. Like in fellow Versus games, Infinite’s hypers are split into levels depending on how much super meter they consume. In a game where only four total bars of super meter can be saved, level three hypers become valuable commodities, but one simple trick lets players pull off these deadly techniques without spending any meter at all. After activating an Infinity Storm, using the same button combination (by default, L1+R1 on PlayStation 4 and LB+RB on Xbox One) will launch a level three hyper even when the requisite resources aren’t available. While this immediately ends the Infinity Storm in question, it expands the mechanic’s possibilities and makes early-match kills on problem characters easier. Continuing with the theme of “why isn’t Capcom telling Infinite players they can do this,” the Soul Stone’s Infinity Storm, which revives characters and gives a competitor control of both their characters at the same time, can be simplified by holding down the tag button (by default, R1 on PlayStation 4 and RB on Xbox One). This limits a player’s controls to just one character, allowing them to set up intricate combos like those demonstrated by the video below. While these mechanics will likely become more useful as Infinite competition progresses, tournament play is currently being dominated by one move: the rose garden. Dormammu, a Marvel Comics villain associated with Doctor Strange and who is canonically more powerful than Satan, brings to Infinite a set of moves introduced in Marvel vs. Capcom 3. By building up the powers of destruction and creation in his hands, he’s capable of unleashing a variety of fiery attacks. One new addition to this repertoire is the rose garden, which covers the ground with fiery brambles that draw the opponent towards the user. As perhaps the best Dormammu player of the Marvel vs. Capcom 3 era, it was a no-brainer for former Evo champion Ryan “Filipino Champ” Ramirez to pick up the otherworldly fighter as a core part of his Infinite team, and he’s utilized the demon’s strengths (namely, the ability to trap opponents with moves like the rose garden) and balanced his weaknesses (relatively poor mobility) with speedier characters like Ultron and Captain Marvel. These skills were on full display at last weekend’s SoCal Regionals, the first major tournament to feature Infinite competition. In a particularly heated match against runner-up Robert “Sacktap” Capps, Ramirez pulled off an “unfathomable” 266-hit combo with multiple uses of the rose garden, some of which captured both of the opponent’s characters and pushed the hit counter even higher. 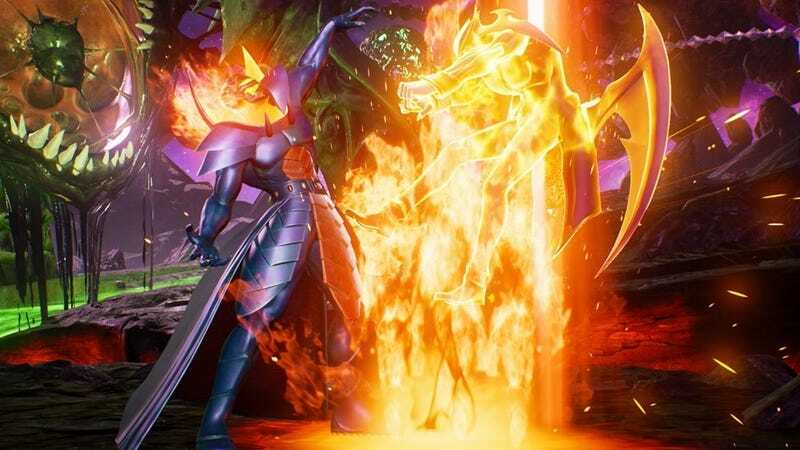 Another player, Richard Nguyen, uses Dormammu in a similar fashion while backing him up with Dante from the Devil May Cry series, whose own lengthy combos provide the Doctor Strange villain enough time to build up the necessary resources for the rose garden. Upon meeting in the losers semifinals match, Ramirez and Nguyen provided the most exciting Infinite match in its short life. With dual Dormammus on the field of battle and momentum shifts aplenty, their bout is perhaps the best representation of high-level Infinite play yet, and shows just how far the game systems can be pushed when two incredible competitors meet in tournament. Marvel vs. Capcom: Infinite is young. What players know about the game now will pale in comparison to what they learn in the coming months, and it’s likely the game’s first appearance at, say, Evo will look nothing like competition does today. That’s just the nature of fighting games; the learning phase that begins when a game is first released is something of a small-scale arms race, with serious players doing everything they can to get even the most miniscule advantage against their competition. This phase is also the most exciting, because as a fighting game player, the entire world is laid out in front of you. The unknown is intriguing! Things like figuring out if Ryu can end this combo with that super or finding the best moment to tag in the Hulk drive competition forward, even if they’re explored for the sake of discovery itself. The intricacies detailed above are just a small part of what makes Infinite tick, and we’re sure to see even crazier developments as time goes on.